At this very moment a satellite is circling the earth, tracking several hundred snowy owls. How? A transmitter backpack is carefully strapped to each owl’s back. Why? Scientists have many questions about these beautiful birds created by God to live in one of the coldest parts of our world. Are their numbers dying out or growing? Where do they fly and for how long? If you want to see more of a snowy owl than a blip on a computer screen, travel to the arctic tundra, part of which is in Alaska. Go in summer when it’s always daylight. Be sure to pack a camouflage tent called a blind, binoculars and netting to shield you from biting mosquitoes. From a window in the blind you can watch snowy owls fly over the flat grassy tundra hunting lemmings, small meadow mice. In summer snowy owls are easy to see. But during the winter their white feathers with brown spots help hide them. 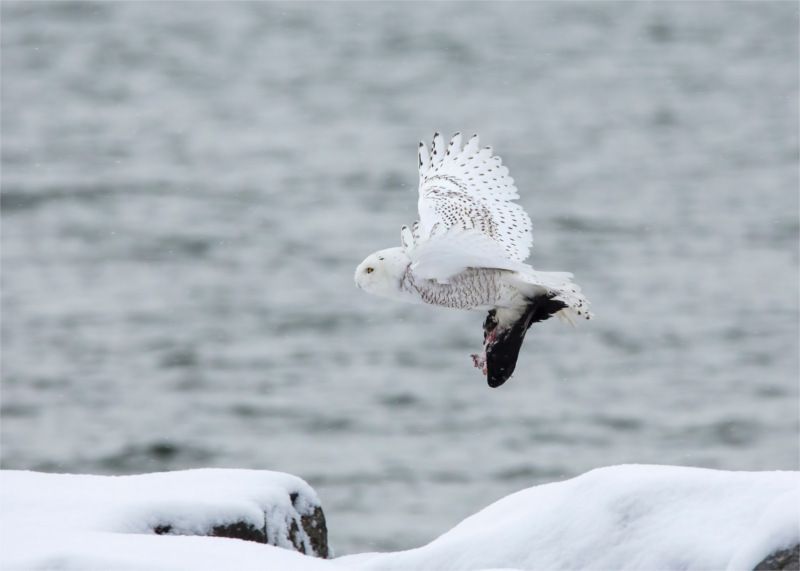 The snowy owl has several special features. For flying, God gave it powerful wings spreading about five feet from tip to tip. For hunting, God created talons (sharp claws) that can grab a small animal as the owl silently swoops just above the ground. For warmth, God covered the owl with a layer of soft down and thick feathers. For hearing, its big yellow eyes are surrounded by stiff feathers that catch sound waves for the ear openings behind them. The snowy owl’s A+ hearing helps when hunting in dim light. Like other owls, it turns its head almost all the way around (270 degrees!) because its eyeballs can’t move. Getting close to a snowy owl is difficult. This strong and aggressive bird can knock down a grown man, especially if its chicks are in danger. From the blind you’ll notice the female builds her nest right on the ground by scraping the dirt and scattering a few feathers. She lays one egg every two days. She’ll lay two to 14 eggs depending on the number of lemmings available for food. Her mate is an excellent helper. He hunts and feeds her while she is laying eggs. After 32 days the first egg hatches. Then every two days another hatches. Soon the nest is full of chicks of different ages. White downy chicks soon turn gray. When they’re four weeks old they leave the nest and scatter. They can’t fly yet so the parents continue feeding them. A clutch of nine will eat about 1,500 lemmings before they’re on their own and that’s only enough lemmings for the kids! Both parents spend the summer hunting, feeding and guarding their chicks. When the short arctic summer is over, the owls all migrate south. They’re often seen in the plains and wetlands of Washington and Oregon. Why not tell a friend about the snowy owl? Then you will be like King David who said, “I will praise you, O Lord, with all my heart; I will tell of all your wonders” (Psalm 9:1).